Why should you choose WP Engine? Save 20%. Get Started Now. WP Engine is a WordPress-exclusive web host. Unlike other general hosting companies, WPEngine only provides Managed WordPress hosting, so the company has built its technology and solutions specifically catering to wordpress based websites and apps. Since the hosting service offered by WP Engine is a fully managed service, the updates and maintenance of wordpress core is handled by the company team of experts in addition to providing customers complete support for wordpress related issues. WP Engine was co-founded by Jason Cohen and Ben Metcalfe in the year 2010. They have raised over $18 million in funding from North Bridge Growth Equity and Silverton Partners and other angel investors including Eric Ries and strategic investment by Automattic. The company is currently headed by Heather Brunner as CEO and Jason Cohen as CTO, has over 300 employees and is headquartered at Austin, Texas. WPEngine also has offices in San Francisco, San Antonio and London. The company focuses squarely on providing solutions to improve the performance, security and scalability of wordpress websites, and hence has garnered tremendous response from web hosting customers who value these over price. It has fast emerged as a market leader in managed wordpress hosting segment. Save 20% off your first payment with WP Engine. Use code SPEEDUP. WP Engine offers 5 managed wordpress hosting plans. Each plan includes unlimited data transfer but is capped at the number of wordpress installs allowed, website visitors per month and amount of disk storage capacity. This plan is for customers who intend to run only one website or test out the hosting service by WP Engine. It comes with 10GB local storage and allows a single website with up to 25K visitors every month. This plan includes up to 10 wordpress installs and is popular with small to medium level organizations having steady traffic flow. The total number of visitors on all running websites is capped at 100K per month, beyond which you will be charged extra. 20GB disk storage is provided with this plan. If you have been growing and experience high traffic levels, Business plan is what you should opt for. This plan allows up to 25 wordpress installs and 400K visits/month with 30GB local disk storage. It is also quite popular with developers and marketers who use it to host their customer websites. This plan is designed for growing businesses with over a million visitors per month. It allows a total of 150 wordpress sites and can be tailored to custom demands. It uses dedicated resources to provide high performance and scalability. This plan is for mission critical websites and applications. It uses server clusters to deliver ultimate reliable, secure and powerful wordpress solutions. It has provision for up to 1TB storage and 5 million monthly visitors and can be customized according to your specific needs. Since the WP Engine plans and pricing is based on the number of monthly visitors to your site, it s important to understand what constitutes a visit. They have clearly stated their formula for calculating site visitors to your websites. Any bot or crawler traffic and image traffic is not counted towards total visits. In case the total monthly visits exceed the limit set by the plan, the customer is charged extra for the same by the company. When you choose to host your wordpress website with WPEngine, you don’t need to care about managing the updates, backups and site security etc. All technical aspects associated with WordPress are managed by WPEngine expert professionals. These include updates of wordpress software and any plugins & themes that you use, website backups, loading speed of the website, security of wordpress, themes & plugins like malware scan and fixes etc. EverCache is WP Engine’s proprietary caching system and is regarded by experts as one of the most scalable wordpress caching mechanisms available as on date. Since, all websites hosted on WPEngine have EverCache integrated into wordpress, you do not need any other caching plugins. The cache is refreshed automatically when required and serves content to visitors at very fast speeds. WP Engine uses NetDNA content delivery network as part of their service. This is included in Professional and above plans. Personal plan customers need to pay an extra charge of $19.99/mo for CDN service. Business plan and above customers get a dedicated IP Address free of cost, while on Professional plan this feature is available as a paid extra. WP Engine offers an exclusive feature of staging sites. This is particularly useful for developers and geeks who often like to experiment with themes and plugins. The staging feature allows you to create an independent snapshot of your website with a single click of a button. You can then test your changes on this cloned version and when you are ready to go live with the changes, you can roll this version to live website. You can create as many clones as you like to test your changes or redesign your website. Each wordpress installation will have its own staging site. Git is an open-source version control system. WP Engine provides integrated version control on their hosting environment using Git-Push-to-Deploy feature. So developers can now create custom code, plugins, themes etc. using Git and then deploy their applications using git-push-to-deploy capability thus providing version control using wordpress. WP Engine automatically updates all minor wordpress patches on you websites. When any major update is released, the team of experts thoroughly tests it, before rolling it out to the customers for upgrade. WPEngine takes daily backups of your website (filesystem, database snapshot and all media) and stores them at a redundant geographically separate location. This ensures your data is never lost. WP Engine gives you the option of restoring any backup copy of your website with just a plain click of a button. The restored version is generally ready in less than a minute. Also you can create any snapshot backup of your website within seconds, which can be used as restore point later on if you wish to undo the changes. WPEngine gives you the ability to integrate your Amazon S3 account with their platform so you theoretically get infinite storage for your media by syncing all files to Amazon S3 bucket. Wp Engine offers GeoIP lookup service that can be set up to dynamically serve different web content to different visitors based on their specific geographical location. So customers no longer have to depend on external third-part services for this functionality. But this service is available for free only on Business plans and above. When you signup, you have the option of choosing one of these locations. If you later wish to move you website to another location, you need to contact the customer support team who will do this for you free of cost and without any need for cancelling your account. Website speed is highly important from several perspectives – rankings on Google and other search engines, visitor satisfaction, revenue generation etc. So a faster website is always desirable. WP Engine claims that websites run 4 to 6 times faster on their proprietary front-end technology, which they continually adjust for achieving maximum performance. They serve content using custom solutions like WP Engine EverCache and CDN to ensure blazing fast website load times. The company uses a highly scalable architecture with HA load balancing and firewalling, and database replication features. These ensure minimum downtime for your websites even during traffic spikes. WP Engine is so confident of their system performance that they promise a service availability of 99.95% as part of their SLA. In case they fail to meet this service availability for any month, customers receive a 5% monthly fee credit for each hour of downtime. WPEngine is highly committed to taking care of security requirements. They employ best methods from testing update patches before rollout, real-time security threat detection software, blocking malicious attacks and IP addresses of hackers/spammers, customer separation at the kernel and filesystem level, proper server configuration, continual network monitoring, automated backups to physical security of the datacenters. They promise to fix your website for free, if it is still hacked. 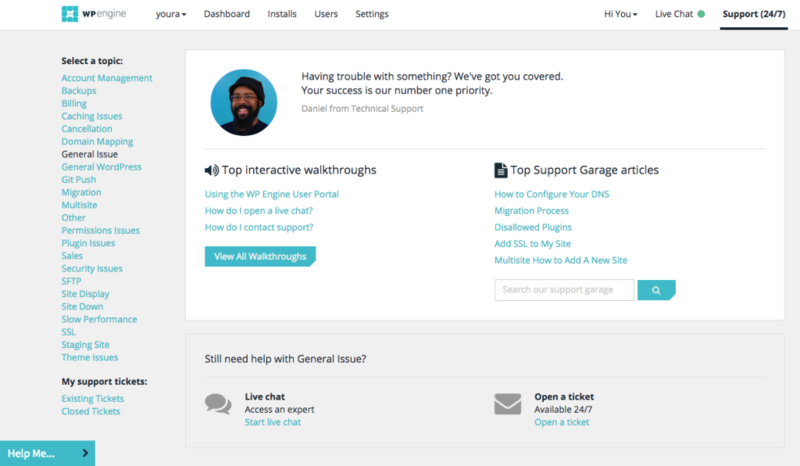 WpEngine provides support to the customers via email, ticketing system, phone and live chat. The ticket system is accessible via User Portal all round the clock, but live chat option is only available from 6am to 8pm Central Time. 24/7 Telephone support is available only on Professional and above plans. WP Engine claims that all their support staff is WordPress experts. So they can very accurately fix your issues and provide help on anything related to wordpress or hosting. The User Portal on their website contains a vast knowledgebase of useful information on setting up your website and troubleshooting any common problems. All details related to managing your hosting account with WP Engine are also included in a separate section. WP Engine includes a 60 day money back guarantee. Their cancellation policy is pretty simple. 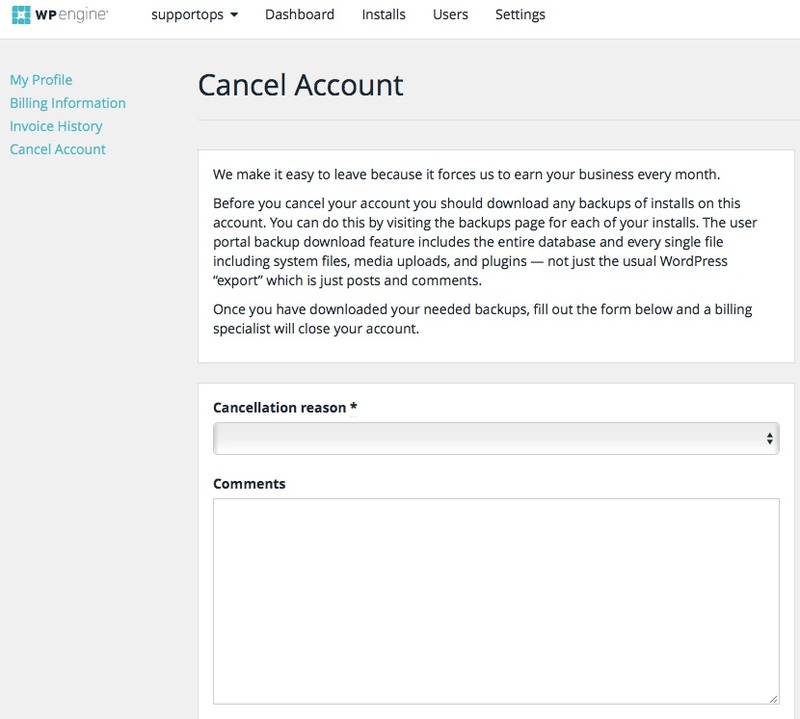 To unsubscribe to their services, a customer simply has to log in to User Portal and choose to ‘Cancel account’ under Settings page. The company maintains a copy of your website for 30 days from account cancellation. They suggest that you download any backups of your installations before cancelling the account. The company requires you to provide a reason for cancellation of hosting service. It is important to know that WP Engine hosting package does not include any email features. So customers need to host their own email accounts to use their domains name with email address. WPEngine recommends that customers use Google Apps service or Zoho Email service. Although, you may choose to use any other service or email hosting for the same. 2nd time in a month @wpengine derped my client's website with accidental rollback. Support helped fast, but I can't recommend this service. It's so easy managing WordPress sites with @wpengine. Great back end tools that help with maintenance & development! @WPESupport @wpengine Got to an agent and faster than estimated. Forrest was quick and helpful! @WPESupport Now 60 minutes. If "instant" support takes this long, @wpengine needs to hire more agents. Not happy at all right now. Great, and test environment indexed. Thanks WPengine. And @wpengine chat support is about as quick as a dead turtle. @boyce – if it's WordPress then @wpengine are rock solid. @krystynheide WPengine is great if you don't mind paying a premium. Just try to stay off shared hosting platforms if you can. @shaptora It's hard to not mention my WPENGINE friends when talking about WordPress Friends. I'm glad to have you in my life as well! @peroty I switch all the time. A Small Orange is good for price, WPEngine (pricey) can’t be beat for WP. SS for speed, but no flexibility. @cobra_winfrey @wpengine Same here. 11 sites down on one account. Other account fine. I'm on chat, but there is a wide issue. @wpengine +1 🙂 That was acted on fast. Honestly expected no change but extremely happy to see your always listening and quickly acting. @wpengine's customer service is top-notch. Great managed hosting! @wpengine are basically the best company in the entire world with 1st class customer service . Extremely impressed ???? @nileshtrivedi would recommend wpengine only for the easy way out of managing your own severs. @codelust I moved one of my sites to wpengine, but it hasn't been good. At this stage, self-hosted and managed are neck-to-neck, IMO. <Sigh>. Disappointed with my call with @WPEngine. Every question I asked the phone rep wanted me to Google it to bring up a page. @wpengine Seems your website and hosted website are down, we're getting an Cloudflare error. @LauraHelenWinn when I was w/an agency we used wpengine and was awesome for many WP sites. but that’s more $$ commercial option. We love @WPESupport We love @wpengine. Thanks Brad! Thank you from Jerry @WPEngine for helping us this morning! He's awesome!! Shout out to Josh @wpengine @WPESupport for helping us this morning! We only use the best hosting for our clients’. @wpengine Ur tech support guy, Mattie, was AWESOME! So patient and helpful!!
. @Virtual360me major kudos to @wpengine. They recognized it and auto-migrated servers. Minimal downtime. Have to give credit where it's due. After a LONG frustrating week with DDOS outages, @wpengine moved me to a new server and all is now well. @wpengine @WPESupport Luis Leal did an awesome job helping me with a site install today! Whoo Hoo! THANKS! Really disappointed with our @wpengine hosting this past week.
.@wpengine is saving my day. Moving my site to them was probably one of my best moves of 2015. Seriously. Now you can enjoy 20% OFF on all WP Engine hosting plans with our special offer. WP Engine Personal Hosting plan starts at $29 per month. Using our exclusive 20% off WP Engine Coupon Code, you can avail this hosting at discounted price of $23.20 per month. Similar 20% Discount is also available on WPEngine Professional and Business hosting plans, that will be available for $79.20/mo and $199.20/mo respectively. Click on the link below to get this WP Engine discount deal.